There is light in our minds. Not the kind of light that comes from the sun or lamps, because the cranium actually blocks those out. So what kind of light is in our minds, then? Swedenborg would say it’s the light of spiritual truth! 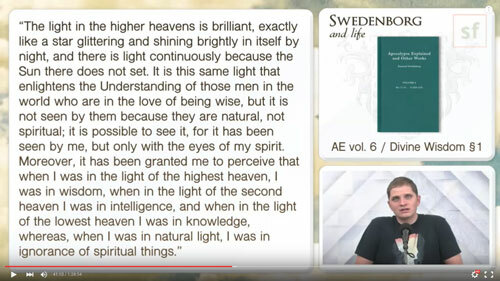 In this episode of Swedenborg and Life, host Curtis Childs and featured guests review Swedenborg’s philosophy on how light and truth correspond to each other based on his explorations of the spiritual world. 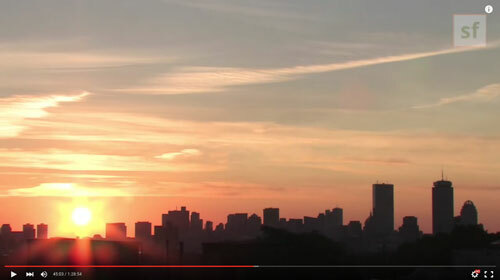 Swedenborg says the physical world is a reflection of the spiritual world, so this introductory segment takes a look at how light works in the physical world. Curtis introduces assistant professor of math and physics Dr. Maxwell Blair to guide us through the study of light throughout history. 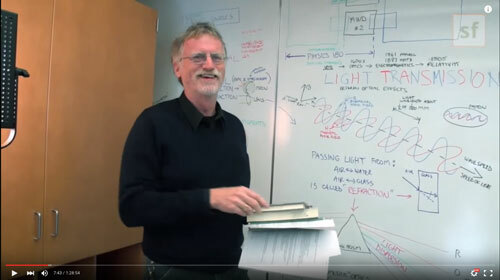 Dr. Johanan Odhner from the Center for Advanced Photonics Research at Temple University then joins in to introduce our modern understanding of light. From this we can see just how vastly complex light truly is. In this can’t-miss clip, Curtis talks about a very interesting debate Swedenborg claims to have had with Sir Isaac Newton about his light and color theory in the spiritual world. You can’t explore Swedenborg’s theology without coming across his correspondences between light and heat. It’s similar to other well-known dualities like light and truth, faith and charity, and love and wisdom. Curtis introduces a quote from Swedenborg’s book Divine Love and Wisdom to help explain these correspondences. So is there light inside the impenetrable cranium of the human mind? Swedenborg would say yes, because the mind is connected to the spiritual world, where the light of Divine love and wisdom preside. 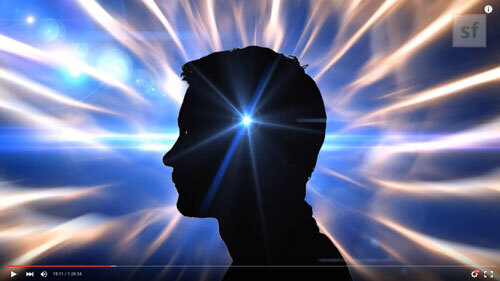 To illustrate this concept, Swedenborg’s philosophy on the inner mind and outer mind are explained in this short animated video clip. In terms of knowing what’s spiritually good and true, it can often seem like we’re fumbling around in the dark on earth, but the ability to exist in a state of enlightenment is always possible for us right here and right now. In Secrets of Heaven, Swedenborg describes how different types of light (also known as colors, as explained earlier in the show) are actually variations of goodness and truth in the spiritual world. In his writings, Swedenborg describes red and white as the primary colors in the spiritual world. Dr. Odhner is welcomed back to explain what Swedenborg might mean by his description of red and white colors in the afterlife. In the spiritual world, light can be an image or projection of a spirit’s character. Swedenborg’s description of the character of spirits is portrayed in this short animation. The spiritual world and the physical world: Swedenborg asserts we’re both here and there at the same time—and that’s how we receive light from both places. Curtis reads a quote from Divine Wisdom to explain Swedenborg’s rationale for this theory. If we’re dual citizens of the spiritual and physical worlds, it’s easy to understand how the sun rising on earth is just like the sun rising in our soul when we become enlightened with a new level of understanding—and that’s a pretty cool thought. Curtis jumps in to explain that what Swedenborg is trying to say here is that God puts out the light and that light is translated through each individual person like a prism. The light from God can be transformed into beautiful light or ugly light—all depending on how the individual chooses to project it into the world. This is very similar to how light interacts with objects in the physical world, which Dr. Odhner explains more in depth. Curtis shares a really cool experiment the team performed with a monochromatic laser. When they put the laser through a prism, you can see all the variations of negative and positive interference it went through, which emulates how God’s light is projected through us. So if we’re prisms of God’s light, then what makes us individuals? Series Editor of the New Century Edition Works of Emanuel Swedenborg Dr. Jonathan Rose joins to explain the theory of intellectual selfhood. What dictates the kind of prism or light that we project as individuals? How can we become as clear as possible to allow the brightest, truest light through? Spiritually speaking, Divine light is everywhere. We can best receive and project that light when we remain spiritually clear of evil and negativity. One way to do that is through prayer, as Curtis explains here. Since prayer may not be the preferred method for all, there are other ways to make conscious efforts to let light in, which can be especially challenging during dark times in our lives. 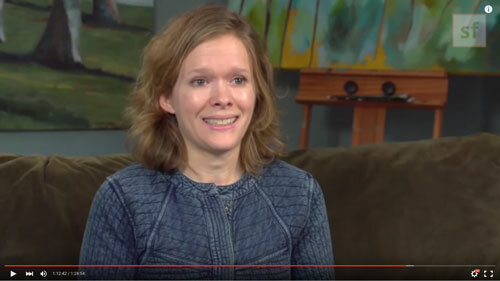 In this segment, special guest Bronwen Henry shares a personal story about her powerful and transformative cancer treatment experience. The most insightful lesson Bronwen learned from her experience was how to be present with darkness. She feels the promise from scripture is not that darkness won’t exist in our lives, but that darkness will never overcome light—and that’s a state of enlightenment she hopes everyone has the joy of experiencing. Does Swedenborg know if there are multiple universes? Much evidence for such. If so, do they run on a Fibonacci sequence or sacred geometry? Is the light sometimes bad? Like familiar spirits tricking us? And does Swedenborg say anything about trying to ignore abilities to talk to spirits? Does it make you sick and lost in life? What does Swedenborg say about being good, but not believing in God? Because I like Buddhism, but the Buddha didn’t talk about God. I know Swedenborg spoke of there being universes outside of our own, but did he ever mention anything about the possibility of parallel or multiples of our own? I wonder why the devil is depicted in red? Also, in heaven, are love and light the same since God is live? Can you die after death? What about sound? Could Divine light as opposed to natural light be experienced in part as sounds…or for that matter texture, shape, movement, and emotion?